A hole in the wall, dive place with great food, steps from the beach. Can it get any better than this? Skinny's Place is very popular "fast food"--burgers and brews for the most part. You can get a cold frosty mug of Bud/Bud-light for $1.50, and they have other beers. Sides include fries and onion rings. 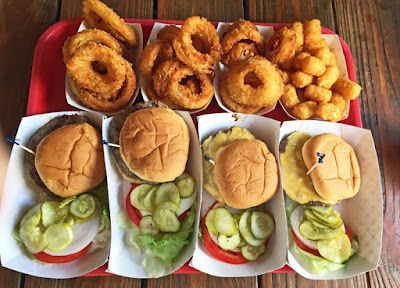 And there are a number of variations on their 1/4 pound burger, up to and including the Mid Island Pounder--4 patties, if you dare. Make sure to say "mayo" or "no mayo" and the LTOP will be on the side (lettuce, tomato, onion, pickles). There is a small bar and some other eclectic seating, inside and out. Order at the window, give your name, and they'll yell when your order is ready. But oh my, it is so worth it. Cash only, by the way. There were four of us and we had quite a great lunch here, as you can see from the picture. We all enjoyed our burgers and cheeseburgers immensely. The tater tots were nice, but the onion rings were really very good, nice and thick, a good breading, and came out very hot, yet not too greasy. The burgers? Well, they may not be gourmet, but they sure tasted great. Add the side dressings and I for one, needed no additional condiments such as my normal mustard and ketchup--this burger was just too good to ruin with that. We were there just before noon on a Sunday in early October, definitely after the "season" is over in Anna Maria Island. Still they were fairly busy, but I'm told that when it's peak season, the place is an absolute madhouse! I can see why locals and tourists alike would flock to this place. 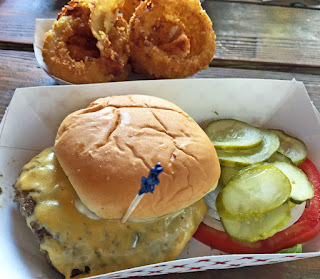 A good burger, an ice cold beer, and only a few steps from the gulf beaches. This is island life. I highly recommend Skinny's. You won't go for the decor or atmosphere, you'll go for the food and be thoroughly satisfied, I am sure of it!